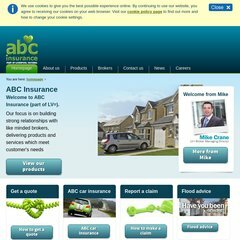 Topics: Abc Insurance, Car Insurance, How To Get A Quote, and How To Report A Claim. It is hosted by Ftip002942995 Lv Insurance Management Ltd (England, Croydon,) using Microsoft-IIS/6 web server. It has 4 nameservers, including ns5.netnames.net, ns6.netnames.net, and ns1.netnames.net. Its IP Number is 217.33.165.234.